From lava fields to thick forests, Central Oregon seems pretty wild. We were also starting to resemble wild things: it’d been a handful of days since our last shower (in San Francisco)... we were in desperate need of some running water. On a whim, Loren pulled the car off the scenic road along the Mackenzie River at Silver Creek Boat Landing, with a semi-formed idea of bathing in the water. We changed into our swimsuits and hobbled down the boat launch to the shore where we tested the water. Frigid. Kristen was the first to dunk and Loren quickly followed. There are few things that take the wind out of you like cold water. It was instant relief to step out of the water, where we sudsed up while shivering. The second time into the water to wash off the soap didn’t seem quite as bad but it was still worth it to keep contact with that water to a minimum! Now that we were clean and wide awake, Loren noticed some plentiful blackberry thickets, and went to town gathering as many as he could. 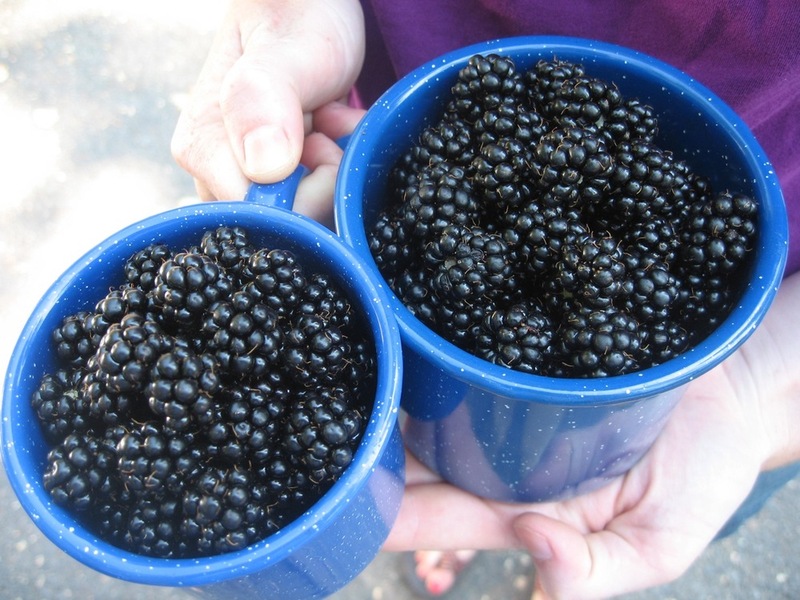 These were perfect, big, ripe blackberries. We ended up with at least a pound (filling both camping mugs we had) which would’ve cost at least $10 back east at Whole Foods, and immediately put them to good use by mixing them with sliced banana, cottage cheese (from Redwoods National Park grocer) and honey (purchased in Sedona). Best lunch yet. Central Oregon, you’re too generous!